I am surprised I hadn’t reviewed Szabo already I had read the doo and Iza’s Ballad and had enjoyed both but it seems they may have both gone unreviewed. So I start with the latest of her books to be translated into English this is a new translation there was a translation a number of years ago but this is by Len Rix who has also translated The door by her. Szabo wrote post world war two and her initial works saw her fall foul of the Communist authorities in Hungary which meant she lost he job in the ministry and became a Teacher for a few years at a girls school. The opening of thw 1934 section and the arrival of the Held’s on the street. This is a tough book to get into. It is a strange collection of voice we come across in the opening. We here about the Elekes family Mrs. Elekes and the children of Katalin Street Balint, Iren and Blanka the sister of Balint who ends up in Greece telling her story and adding the story of Henriette Held the daughter of the \jewish Dentist. Then the novel becomes more straightforward as we have a number of different years that follow the children of the street from 1934. That is when the Jewish Held arrive on the street and quickly become part of the street Iren gets a gold card from her teacher her father is the head teacher much to the dismay of her sister Blanka the sort of wild younger sister the children of Major Balint. Blanka notes Balint always had a thing for Iren. This is shown when the two of them get together. The father the Major tries to help the Held’s but is unable to stop them going to the deaths. Blanka is horrified by the war and post-war is a different person as we see via the Balint now a doctor working at the same hospital as Blanka. the street itself in 1956 is having a facelift as the old house they all lived has changed. The next two sections round of the stories of the Eleke’s parents, Iren their daughter the youngest now in Greece and son of the Major. Also, the spirit left behind of the young Henriette Held is there seeing the post-war times. Even today I don’t understand why it was only then, and not much earlier, that I realised I was jealous of Henriette. Ever since she had moved into the street she had somehow belonged not just to all of us but especially Balint. That he had never smacked her as hard as he did either Blanka or Me was not in itself surprising, She wasn’t the sort of person you would ever want to hit, being so quiet and timid, and the smallest of the three, There was a certain pleasure in slapping Blanka, in pinching her leg ir smacking her bottom, but it was never like that with Henriette. Iren remember the fragile Henriette in 1944 when she dies like her parents. I was reminded of when I was a child and would get a jar or bucket full of creatures from a rockpool and watch them over the coming days some lived others as I was too young to know to need the changing tide to feed and were trapped in that rockpool I had caught them in. This novel like that Bucket is a microcosm of the rockpool. Szabo has gathered together four children and the parents like the little fish and shell creatures of the rockpool and we watch them over time. The events they see have changed Budapest and its own Microcosm forever from the end of the great Austro Hungarian years in 1934 till the shadow of the Nazi and the loss of the Held’s echoing so many others in the city. The post-war years and people like Blanka seeing the world with eyes afresh after the war and being changed by the war and what she saw. Szabo gathers the horror and the post-war communist suffering of Hungary. 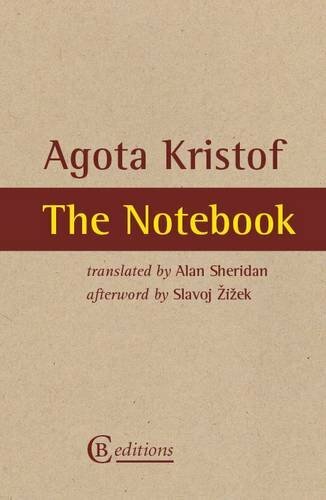 in fact, this novel is maybe one that needs reading now as we see the suffering of both sides here and the world before that in a brief glimpse at what was a better world before the chaos of the Nazi and Soviet eras of Hungary. Not the easiest book to get into but worth the last two-thirds of the book. Have you read Szabo or have you a favorite Hungarian writer? Well, I pleased that this cycle of the year club Simon and Karen run is on 1977. 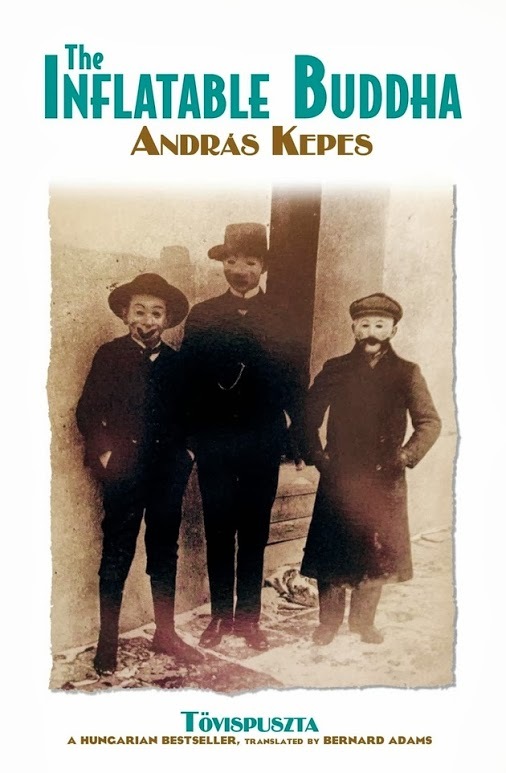 As when I looked up books that had been published in the original language that year.One of the books I found was the debut novel by Peter Nadas, I reviewed his Magnus opus Parallel stories a few years ago. Nadas is one of the most regarded European writers. He own story reads like a novel he lost his mother at 13 and his father when he was 16 leaving Nadas and orphan. When his father committed suicide he was the head of a ministry that had been accused of various things. When Grandpa died, grandmama filled the largest pot with water and put it on the stove. She poured two handfuls of salt into it and some black powder and then kept stirring . In the boiling brew she cooked her brown, gray , and dark-blue dresses untill they were black it was bad about the gray one, I liked that dress, especially when she wore it with the gold butterfly broch.Only her satin dress with the big flowers she didn’t cook, she left it the way it was – black flowers on a white background. Death is a recurrent theme but like this passage I was remind of how Victorians mourned at times. Like parallel stories, this is a novel set in the heart of Communist Hungry.This is a first thread and how they were able to break families But also it has a second and third part. The second line is a family saga. Simon the grandson of a family is in sent to an institution where everyone lives in silence. He keeps himself going with remembering over time his family story from his grandmother and grandfather at home the grandfather whom at times seem half dead. Had been one of these men that loved telling stories and tales these are what heartens the boy in a silent world. They also lead to the third thread in the book which is stories and thoughts around religion and communism. Both Catholic church and the Jews histories are told to the boy from his grandfather bring threads of their lives to Rome and the other way to Jerusalem. as a young boy becomes a man as he has also in this time lost his father and mother and being drawn into the adult world much earlier than he should have been Simon only solaces is remembering those tales and trying to draw some heart out of them. Simon was used to help fetch bits from the market in those hard communist days of waiting being a sport this is later in the book showing the shifting feel of time at times in the book. Like in parallel stories Nadas paints bleak times with a brush that makes his words float off the pages and through Simon and his world show even in the worst of times there is a glimmer of light to lead the way. 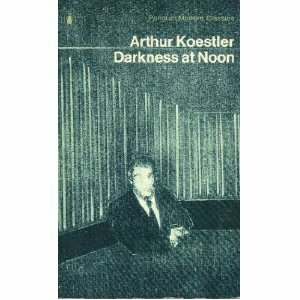 It is a book that drifts through time this is also something he did in Parallel stories. Then there is Death and one must feel the fact that both Nadas himself and Simon had lost their parents the feelings of loss must be Nadas own and death is a recurrent theme in his books, lives being cut short. But also a sense of how the communist world of the 1950’s when the book is set would strangle those who did fit in and break the others who tried to be themselves. I was sent this very early this year its publishers have sent a lot of review copies out for a debut novel by the Hungarian film director Peter Gardos. He has directed a huge number of films since the early 1970’s . This book is also a film I will include the trailer for the film at the end of this review as I found it very touching. The book came about when Gardos father passed away and he discovered a box of letters from when they first met shortly before he was born. That he was given to him by his mother these hadn’t been read since 1946. Dear Nora, Dear Eresbet, Dear Lilli, Dear Zsuzsa, Dear Sara, Dear Serena, Dear Agnes, Dear Giza , Dear Baba, Dear Katalin, Dear Judit, Dear Gabriella…..
You are probably used to strangers chatting you up when you speak Hungarian, for no better reason than they are Hungarian too. We men can be so bad-mannered. For example, I addressed you by your first name on pretext that we grew up in the same town. I don’t know whether you already know me from Debrecen. Until my homeland ordered me to “Volunteer” for forced labour, I worked for the independent newspaper, and my father owned a bookshop in Gambrinus Court? Miklos letter to the 117 woman from his hometown in refugee camps in Sweden . 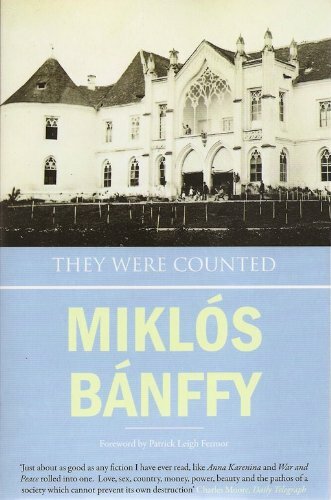 Miklos has ended up in Sweden in the chaos that followed the end of the second world war having been liberated from Belsen , he has ended up at a refugee camp. But he hasn’t a bright future he has been told he has just six months left in this world so this crafty chap gets someone to get a list of all the woman in Sweden from his home town in Hungary. The list ends up with 117 names so he spends time writing a handwritten letter to each of them. HE sends them out not knowing what will happen . He gets a reply from Lili a woman touched by his letter but also a daydreamer so what happens is a love in letters as the two start to write to one another in the chaos of the post war years this shining light of a love blossoming that slowly drags the half dead Miklos to life and away from death.As both have wounds from Belsen to recover from the strength of the love built-in words show the power of words to sooth the soul. I’m unlikely to be the person you were thinking of, because, Though I was born in Debrecen, I lived in Budapest from the age of one. Nonetheless, I’ve thought a lot about you. Your friendly letter was so comforting that I would be happy for you to write again. Touched by his letter and to break her own Boredom Lili writes back and the story starts off ..
What is not to like in this well I am a romantic and I love stories like these. I love that Peter found his fathers and mothers letters and worked them into this book. I just love the sheer chance of the story a Hungarian man and woman fall in love in the utter chaos of post war europe in Sweden one dying the other looking for a way to live both wanting a new future and all this story told by their own son sixty years later. It is one of those true stories that almost seem unreal. The two characters stories draw you in the lament for their past that they know after Belsen will never be there again the city the grew up in is for ever changed.This is one of those books I’m sure people will talk about a lot about this book for a book club as it touches your soul if like me you are romantic and believe in love conquering all .Here is the trailer I love this trailer . I choose perfect day by Lou Reed as it mix part of what is in this book there isn’t a perfect day and this wasn’t one but seemed it . I wonder if I am the only one that tends to go the other way in times of trouble and read the tougher books to read when in times of trouble . 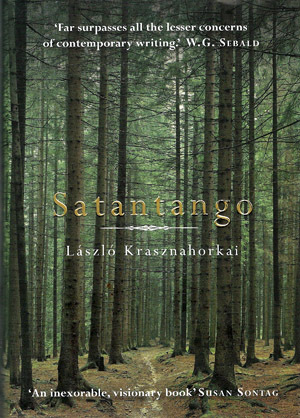 So I found myself picking up my second novel to read by Krasznahorkai , the other week of course I had been remind I has it when he won the recent man booker international award .Krasznahorkai is best known for Satantango which is the other book by him I have read . He has since the fall of the soviet bloc traveled the world hence this novel which is written 20 plus years after Satantango is set mainly in japan but also in various places and times . He has spent the last decade in both Japan and China . Everything around it moves , as if just this one time and one time only , as if the message of Heraclitus has arrived here though some deep current , from a distance of an entire universe in spite of all the senseless obstacles , because the water moves . The premise of Seiobo there below is the Japanese goddess once every 3000 years has a peach tree in her garden that bares fruit and this fruit gives who ever eats it immortality . Now she decides to search for perfection on the earth thus setting up the sequences of stories that follow in the book as we see her follow various artist actors and such .Trying to find what is perfection but is perfection what it seems , is that great actor the face every one sees when he acts , or is he different behind the scenes ? How do you get the perfect colour for that picture .What makes great art and is their great art with great artist , do great artist make great art .Each story leads some how in some way to the next as we follow Seiobo on her quest . Well as you see as ever something seems to escape me in Krasznahorkai writing but l, I can put my finger on it here for me as a reader it is time . This is like me being given Boy and Actung baby by u2 or even Tender prey and push the sky away by Nick cave . Now these are all great records but can you list to Boy then actung baby ? it is like I have broken the sequence as with this book which chapters follow the Fibonacci sequence maybe I have jumped in my reading of him from boy to actung baby and am feeling a bit disjointed .I mentioned Nick Cave as to parapharse him when he was speaking to Blixa Bargeld in the documentary 20000 day on earth he wish he had learned to edit at an earlier age , but why to me Satantango is Krasznahorkai Tender prey rough uncut and totally addictive , but for me I feel I have to read the other books by him in english and at a later date return to this one to fully get the sense of this as a book .As for now I was reminded of the film pi by Darren Aronfsky , which sees a young mathematician driven to madness by the search for perfection in maths like that Seiobo search for the perfect person to receive the peach is actually a flawed one art is in the eye , the moment , the time , the subject and can be perfect for only a split second .So i will return with a longer review after I have in a few years read his other books as I get hold of them in english . Do you like jumping about in a writers life ? Well I’m back after a couple of weeks and have decide to start with one of those books we al have read and the second we put it down would happily read it again a real breath taking novel .Agota Kristof is a writer a bit like this blog that covered Europe in her life itself .She came from Hungary ,but escaped just to become an exile in the 1950’s in Switzerland .She start to write in french at the age of 51 after studying french ,this book came out in 1986 originally .It won the Austrian lit prize as I say a write like this blog that in her life spent time all round Europe .The notebook (or grand notebook in french although that means slightly more in the french ) was the first of what became a trilogy of novels the other two are called The proof and The third lie . Their first impression of the grandmother isn’t great . The notebook is the story of two children Twin brothers ,who just before the outbreak of world war two are left in a small village with the Grandmother .Now this book is their account of this time from the war to the Soviets taking over after the war .We see the world through their eyes but also the cruellness of this world .The grandmother isn’t bother about them and takes the money their parents send for herself .Now this village has a wonderful collection of oddball character a cobbler that helps them out because he hates the Witch as their grandmother is known within the village ,A sad girl with a horrific harelip ,who just wants to be loved but finds it in all the wrong places especially in one eye-opening scene in the book ,An officer that very cruely treats the twins .The booys quickly learn that to get what they want and to survive the shifting worlkd they are caught in as we see what we may assume is Hungary (we aren’t actually told ) but could be anyone of half-dozen countries that are caught first by the Germans and then as the war is ending the Soviets overrun the country and bring the communist system in . We put on dirty ,torn clothes ,take off our shoes ,dirty our faces and hands .We go out into the street ,we stop and wait . When a foreign officer comes by ,we raise our right hands to salute him and hold out our left hands.usually the officer walks on without seeing us ,without looking at us . They beg from the Armies in the village as they pass by as they get so little from their grandmother . Antal Szerb is another writer that was rediscovered by Pushkin press .Antal Szerb was born to Jewish parents ,but was baptised into the Catholic church ,studied Hungarian German and English ,lived in France and Italy ,even spent a year in England .this book was originally issued in 1924 in Hungary as though it was a translation from English as due to his Jewish heritage it couldn’t be published in his homeland .He later was deported and died in a concentration camp in 1944 . The situation in Alturia was as follows. Simon II, father of the present king, Oliver VII, had been an outstanding ruler, and the country had suffered in consequence ever since. He modernised the army uniform, established elementary schools, introduced telephones, public ablutions and much else besides, and all this benevolent activity had exhausted the state finances. Besides, as we all know from our geography books, the Alturian people are of a somewhat dreamy nature, fanciful and poetically inclined. How he came to the throne . 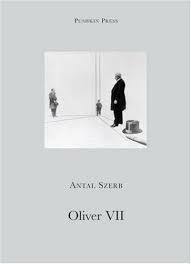 Oliver VII is set in a fiction middle European state Alturia a small state that only exports a few products .But this country is maybe a mix of all the lazy traits of Europe nations as the people the King Oliver VII reigns over are actually the most care free and relax bunch ,also huge dreamers and the King himself is like his subjects so hatches a mad plot to pretend to stage a coup and the return at a later date he in fact overthrows himself ,then goes and travels too Italy and there falls in with a bunch of Con people who leads to whole unexpected turn of events for the King . King Oliver entered his capital amid general rejoicing. The streets were a-flutter with flags; the Westros department store was adorned with huge portraits of Oliver and Princess Ortrud, seemingly made from entire rolls of silk and broadcloth; mothers held their children up to catch a glimpse of the happily waving King, and loyal inscriptions such as ‘King Oliver—King of our Hearts’, and ‘We cannot live without Oliver. Long live the Great Triumphal Return!’ were daubed on walls. When Oliver VII finally returns to Alturia . Now this book is what I love about Pushkin in a shell ,had they not found and brought Szerb to English readers we would missed this central European lterary Gem .The book is part farce ,part satire .But also maybe a huge comment on what matter as the people of Alturia are poor but happy .There is also a sense of maybe the Europe describe in the book at the time Szerb was writing the book of course mid world war two the idyllic scenes and lives he imagined of the king and his subjects was dying out .I also felt this remind me of the humour of Palin and co in their ripping yarns it has that feel of being just left of real almost believe so yes a tale of a king wanting time of and finding the perfect plan by doing a imagine over throw ,also the american film wag the dog tackled a similar concept in a modern setting instead of a coup using an imagine war .Another book that shows me what is great about small publishers and also translation ,because yes there are many stoners out there, but on the other hands there is loads of Szerb awaiting discovery to use English readers still . Have you read Szerb ? Andras Kepes was educate in Europe ,Latin america and the middle east as he grew up .He the wnet on to study to get a degree in aesthetics and then studied further in the US .He then he became from the 1980’s onwards a well known figure on Hungarian tv as an interviewer of figures connected with the arts world he is like a Hungarian Melvyn Bragg.He has written a number of books ,this is his first to be translated into English . He was a great fan Isri , and his unreserved enthusiasm rubbed off on him .This particularly because even in elementary school David had done Isti’s homework for him .It didn’t bother David at all that the teacher gave him a worse mark than Isti. “Comes of being ” Jewish Isti would say patting David’s face ,and they would laugh together . Even early on David being Jewish was noticed by his friends and what it meant to some . The inflatable Buddha or as its Hungarian title translates as thorn bare. It follows the life of three boy growing up ,through the 20th century in Hungary ,as the back cover says an experience that has been more than others have in their entire history .So the story starts when the boys are young in the 1930’s .Pal , Isti and David form a close bond early on and then as they see the war come on as they are an upper class boy working class boy and Jews as the war appears on the scene they find there lives separate and bonds broken then after he war they drift apart but some how keep in touch eventually all arriving back in the childhood home .Meanwhile the country of their birth is tumbling through tough times we see how the events of the Hungarian uprising of 1956 affect the three now men and there young families ,the tough times after that due soviet crack down .Then how the changes after the fall of communism and the new freedoms and how they effect people .A wonderfully well crafted tale of how Hungary in its own way has been involved with most of the Major events of the 20th century and how it effect three boys that became men ,husband ,fathers they all at some point left and then returned to their home town which is own by the Baron of the village . Isti had been to Budapest only twice before the wat and now looked in amazement at the destruction wrought on the city , the houses disembowelled ,their spines of their roofs broken and the bridges which hung crippled and wrecked , into the Danube ,it was as if he saw his own deformed leg everywhere . The post war world needed to be rebuilt . Well I read Parallel stories last year which thou narrative is a more complex take on Hungarian and east European history during the 20th century ,but this book has the feel of being a more personal take on the times than the Nadas book was and for me it worked better as a novel about being Hungarian during the 20th century on a personnel level rather than being viewed as a part of the whole story .The three boys are a good cross-section of Hungarian society and show how some fall ,some rise and some had to escape Hungary during the 20th century .But above all else what comes out of the book ,is the bond of friendship and how it can survive those changes no matter what . Though Balint realized that he would see Adrienne that evening the thought had little effect on him .It caused neither joy nor that slight irritation he had felt previously when he thought of her marriage . They were counted is set in the noble families of the Austro-Hungarian .We meet to Cousins both Counts Balint and Laszlo .Through these two we see the decline of the world around them the world war is not upon them but the early seeds of this are blowing in the wind Balint is drawn to the struggling peasants from Romanian and starts to champion the rights of the poor ,whilst his other cousin is drawn into the world of the upper class gents of the time gambling at the gaming tables .This is 1906 and the world around them is speeding up .All this set in the grand house and shooting parties of the upper class of the time .The family castle as we see Balint and Adrienne twist and turn round each other .This book fits his career as a set designer you feel he draws the world around these two in the book and we’ll get to see what happens in the following volumes . The cousins have their own problems Laszlo is money . Well I kept the description brief this is a huge book and too much for a review .I was reminded of so much I ve seen before from the other side yes this is like the first series of Dowton Abbey the one before the war these cousin are like an Austro Hungarian version of the cast there is even an on/off love affair at their ancestral castle home .I was also reminded of the film shooting party that follows an English shooting part just on the eve of world war one maybe a bit after this book is set but you get the same feel of a world in the background in flux .This book was lost til rediscovered after the fall of communism and is one of those books you’ve seen and maybe even heard of but I say you should pick it up I really can’t what to see what happens in this world in part two how does the cousins world turn out will the gambler Laszlo come a cropper ,will the socially mind Balint stay so ?There is numerous names mentioned on the cover Tolstoy ,Proust being two I ve seen in connection to this book .I felt his echoes in books b modern Hungarian writers the scope of vision remind me of Nadas ,The upper class world is also like Waugh’s world at times the manners and customs also different at times show how much these worlds had in come before they went to war on either side during world war one . Well after a year of going how am I going do this wonderful book Justice and a rereading (which is rare for me ) .I feel with it being named on this year’s IFFP longlist I am finally able to review it .So László Krasznahorkai is probably alongside his fellow Hungarian write Peter Nadas the best know Hungarian writer .He studied Hungarian literature and Language at university and after he qualified he became a writer straight away .Satantango although his third novel to appear in English was actually his debut novel .The book was also made into a seven hour film by the well-known director Béla Tarr nine years after the book came out in 1985 .I did watch the film many years ago but remember it being slow and very tough to follow at point but the main feel was the feeling of an Isolate community in flux due to one man . So Satantango the novel its self is the story of a remote farming community working on a dying collective farm .The people who are there are drinking to forget and have a wholly bleak outlook on life .The book builds a glimpse of there lives when this man /devil arrives Irimias and his friend servant sidekick Petrina .Now when these two enter its starts a chain of events that seize the village and the people there in change greatly ,outburst of violence and revenge ,some horrific scenes to what is a bleak dark grey world already .Is he the devil well the is some feeling he has gone from the village and returned ,but has he change has the village change ,has the way he has changed set the village of the way it has ? Quietly ,continually ,the rain fell and the inconsolable wind that died then was forever resurrected ruffled the still surfaces of the puddles so lightly it failed to disturbed the delicate dead skin that had covered them during the night so instead of recovering the previous days tired glitter they increasingly and remorselessly absorb the light that swam slowly from the east . Well that is enough about the story it hard to describe without spoiling the book and the fact there is so much I could quite easily write a thousand words on the story but then it be spoiler filled .So where does this book fit in the grand scene of things ? Well it is easy to draw comparisons to feel central European figures writing at the same time or just before Krasznahorkai people such as Thomas Bernhard ,Peter Nadas ,Milan Kundera and Witold Gombrowicz it falls nicely in with them style wise it is what is described as modernist the book drifts from the observed ,to the imagine and back .Of course the bleak setting and over all feel of despair brings to mind Beckett for some review’s I’ve read .But for me I felt this book had a lot of central European mythology ,that has been brought to the modern age and also what makes myths, a man who may or not lived some where returns things happen ,this is what start the witch hunts of the past the return stranger ,a figure , a being ,even animals that have thus cause chaos ,in isolate communities strangers or people who have appear to change because they have been to the outside world are always the catalyst for change so here Irimias is that catalyst or as they have been called the bogeyman ,the devil or the many names that have appear in European mythology over the centuries .The book is also a hard-hitting polemic in the reason why collective farming in communism had failed the despair and hopelessness of the characters is there to see on the page .Although written nearly thirty years ago this book is still as fresh today as the day it was written in fact I would say its influence can be seen in other books particularly the book I read last year Hansens Children another book more recent about the fall of a remote community during communism .A tango with the devil indeed rather like the book that build from chapters up then down you be left breathless wanting more and thinking for the rest of your life about what happen in this book .